Pen and oil on board. Delicately observed pen and oil glaze sketch signed and dated bottom left. 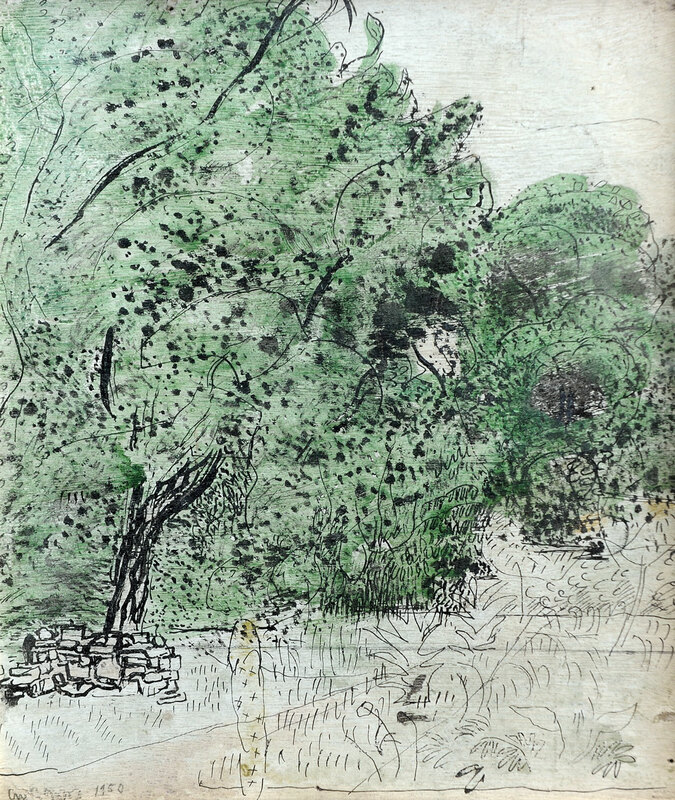 Gross spent the summers of 1949 and 50 in the small village of Saint-Matré in the Lot where he and Hayter made many outdoor sketches of the surrounding countryside. Belgrave Gallery label verso, 1981. Anthony Gross was born in London in 1905 and studied painting and engraving at the Slade. Later he studied in Paris and Madrid and spent much of his time in France. In 1940 Gross evacuated his family on one of the last ships to leave Bordeaux. He was appointed an Official War Artist and landed in Normandy with the Allied troops on D-Day, holding his materials aloft as he waded ashore. Gross was very prolific, producing more than 500 pictures during the War. Post-war, he stayed in France before finally buying a house in the south-west in 1955 and settled into a pattern of living and working there during the summer but returning to London each winter. In 1980 he was elected an R.A. Gross died in 1984.